Budapest. 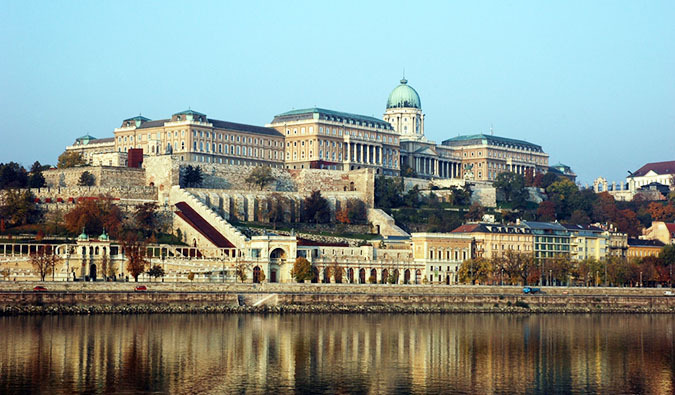 The beautiful city on the Danube. It’s a city I’ve never heard anything bad about. “If you love Prague, you’ll love Budapest,” people would tell me. And they were right—I did like Budapest. Not nearly as much as I like Prague, but that’s another story. This story is about Hungarian folk dancing. Before I went to Budapest, I called a friend of mine. “Do you still have a friend in the Tourism Budapest office? Do you think he could give me a city visitor pass?” Well, his friend did better than that. A few emails later, I was meeting Marta, who not only gave me a city pass, but was my tour guide for the week. Marta was the office intern, and when she offered to show me around the city, it was an opportunity I couldn’t pass up. We always dream of having a local guide, and here was mine, ready to show me the “real Budapest.” As travelers, we go from tourist site to tourist site, longing for an in-depth look at local life. What exactly is the local life in Budapest? Well, it involves a lot of food and dancing. Marta and I did all the major tourist sites. We saw the castle, the church, the famous bridges, the famous baths, and did the tour of the Hungarian Parliament. I was most excited to see the underground tunnels below the castle. I love “under-ground tourism,” whether it’s the sewers or catacombs of Paris, the ghost tours of Edinburgh, the ruins under Naples, or tunnels under a castle in Buda-pest. While cool, the tunnels had little fake statues of people and an art exhibit on consumerism that made them feel a little cheesy. Marta is an avid folk dancer, and one night she took me to a local dance session on the Buda side of the city. While Pest is busy, modern, and the center of the city’s life, Buda is where you find the castle, the cobblestone streets, and the old Eastern Europe you imagine in your mind. Walking down cobblestone streets lined with brick buildings, we stopped at one, entered into a large square, and were treated to a local Hungarian beer hall. Marta did all the ordering. Beer and food were placed in front of me, and I was simply told to eat. Sadly, I didn’t write down the name, but the crusty bread with a sausage spread was really good. The meat was a little spicy and smoked and the bread same-day fresh. I had two. Editor’s Note: I took this at night with a point-and-click camera. The video quality isn’t great. Apologies. The dancing continued long into the night. Beers were served and drank. More food was placed in front of me. Spending time with Marta gave me a view on Hungarian life I wouldn’t have seen otherwise. I learned a lot about the food (Hungari-an food, while heavy, is also quite delicious), the culture, and the history of a place I wouldn’t have been able to glean just from seeing sites listed in a guidebook. She introduced me to traditional food, took me to local markets, gave me an im-pressive history of the city and country, taught me some Hungarian, and, of course, took me dancing. Wandering around with a guidebook would never have even given me a drop of those experiences. Simply seeing the top sites or activities listed in a book doesn’t tell you about how life in a destination is lived. For me, I travel to know that. Big Ben is great, but how Londoners live is more important to me. It makes me appreciate an organiza-tion like Couchsurfing even more. Couchsurfingconnects you to locals who will let you stay in their home or simply meet for drinks. In Munich, I met locals who took me to a local rock festival—an experience I never would have done or known about if not for them. In Broome, I learned about Australian politics. In Denmark, I was taken to a family’s Sunday dinner. Traveling to a destination doesn’t mean you need to visit place X, Y, or Z in order to have seen it. Sometimes it means clos-ing the guidebook, skipping all the must-sees and dos, and simply spending time folk dancing in a beer hall with a group of strangers. Nam sit amet nisl vel ligula tempus aliquet. Praesent arcu nunc, commodo sit amet mauris luctus, sodales sodales neque. Cras mollis dui ac lectus convallis varius. Etiam sit amet laoreet elit. Phasellus pretium mi ac tincidunt elementum. Nullam egestas orci in dolor pharetra, ac feugiat neque dapibus. Suspendisse quis facilisis elit. Aenean pulvinar, quam molestie luctus imperdiet, dolor nunc pulvinar enim, vel vulputate lacus lacus vel felis. Sed massa purus, consequat ac placerat ut, posuere eu nisi. Duis nulla nunc, iaculis luctus efficitur pellentesque, volutpat at tellus. Aliquam lectus ex, laoreet a faucibus a, dictum a sem. Fusce non quam gravida, sodales dolor ac, molestie nulla. Proin et diam eget neque volutpat ornare. Curabitur tempor interdum blandit. Integer egestas fermentum egestas. Nam rhoncus et justo sed dictum. Nulla lobortis quam et ipsum lobortis rhoncus. Aliquam bibendum tincidunt orci. Aliquam convallis felis id justo vulputate, vitae eleifend neque dictum. Integer in nunc at risus tincidunt porttitor ac et sapien. Pellentesque habitant morbi tristique senectus et netus et malesuada fames ac turpis egestas. Aenean et erat ipsum. Maecenas consectetur id ligula ac gravida. Maecenas rutrum nisl id erat ornare ultrices. Cras egestas dui nec nulla tempor, id finibus eros interdum. Donec consequat ut turpis quis commodo. Donec non interdum magna. Praesent eget blandit urna. Sed aliquet quam ac diam posuere, et aliquet nisi facilisis. Nullam sollicitudin, est at pretium vehicula, metus risus laoreet felis, suscipit ornare magna diam tempus velit. Cras dapibus magna nec tincidunt pellentesque. Nunc pharetra nec lectus vitae posuere.